Half way from Akureyri and Myvatn is Goðafoss (God’s waterfall), so named because when the region converted to Christianity, the chief threw all the old Viking religious icons over the edge. The snow-storm was blowing a gale, but we arrived just as the sun rose over the mountains and the mist began to clear. Walking tentatively out to the falls, it wasn’t immediately clear which parts of the snowfield were safely laid upon volcanic rock, and which spanned minor tributaries of the river, but we got close enough to have a good look. To complete the set, we also wanted to visit Dettifoss, the highest-volume waterfall in Europe, nominally two hours away by car. The route passed Lake Myvatn and then climbed higher, and ever higher. The road surface vanished beneath drifting snow. About 40 minutes shy of the route indicated by our hire car’s GPS, I suddenly hit the brakes. There was a signpost to what was clearly a shorter, better way to the waterfall. I reversed, turned off the highway, and almost immediately came up against a chain slung across the road and a sign, ‘Impassable in winter’. Obviously the computer knew something that we didn’t. I reversed back onto the highway, and we continued on. The tarmac ran out and we were technically on gravel, but it made little difference because the road was anyway covered in sheet ice. We crossed a tiny little suspension bridge, turned a corner, and piled into a deep snow drift. Another chain. Road closed. We now knew something that the computer didn’t. Reversing our tracks, we headed back toward Lake Myvatn. 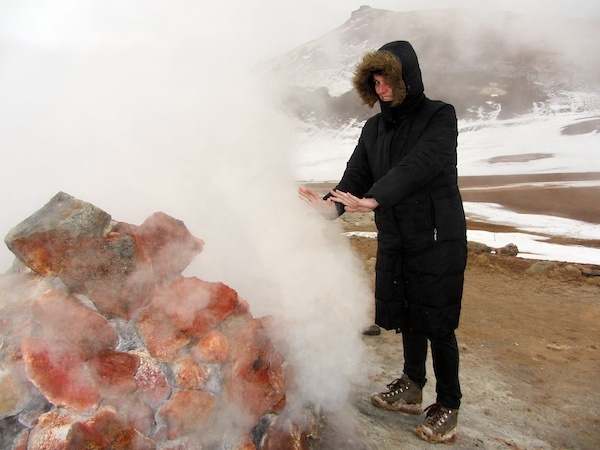 The nearby volcano of Krafla has erupted 29 times in recorded history, so the area is full of geothermal features. We stopped off to look at the volcanic fields of Námafjall, a colourful area of steaming rock, bubbling mud pots, and smoking fumaroles. The thermometer claimed 1 degree centigrade, but the wind chill was bitter, and we were glad to warm ourselves by the bubbling vents. Across the road is a geothermal power station. We discovered that the visitor centre was closed in winter, so we decided to drive up to the volcanic fields of Krafla but the road was blocked by snow and anyway, even if we’d got through, any kind of hiking would have been precluded by the blizzard which was now coming in horizontally. The only sensible thing to do was to go swimming, so we headed for Myvatn Nature Baths, a geothermal hot swimming pool. We were warned that because of the strong easterly wind, the western end of the pool was off limits because all the boiling water tends to congregate downwind. We ventured tentatively in that direction, and it was indeed blistering. The rest of the pool, though, was lovely, and the wind was continually churning the water so that there were pockets of warm interspersed with pockets of really hot. There was also a cold swimming lake and a pair of steam rooms. Bliss. Eventually dusk started to fall, and along with it, more snow. It was an interesting drive back to Akureyri, but we made it down to sea level with only minimal sliding, and were soon tucking in to a good warm fish dinner at the hotel. This entry was posted in Europe, Iceland, Travel on 2014/02/07 by Reinhard. Looking at the terrain in more elevated stretches of the 864, thinking that you might have little more luck approaching Dettifloss from the North through Jokulsargljufur National Park but probably just as icy and snowy once within 5 km of falls. Dip in the Nature Baths looks like good compensation though! Hi Andy, I’m afraid all the approaches seem to be thoroughly closed. I guess the snow ploughs are quite busy enough clearing the No.1 highway!